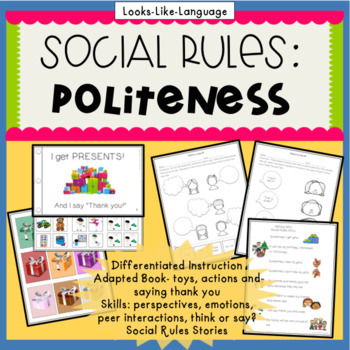 Have fun practicing the social skill of responding, "Thank you!" 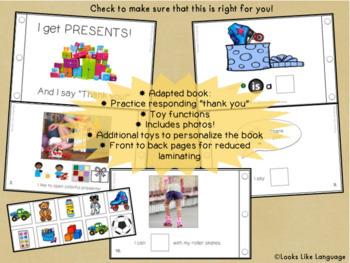 with a gift theme at varied levels for differentiated instruction in this symbol supported activity set. Start with saying ‘thank you’ in an adapted book and build skills: thanking peers, stating opinions about toys politely, determining if statements are polite or rude and how they make others feel, and paying attention to peers' perspectives on toys and activities. The gift papers are generic and no specific holidays are mentioned, so this is great for birthdays and gift giving at any time of year! * I can't wait to get more! 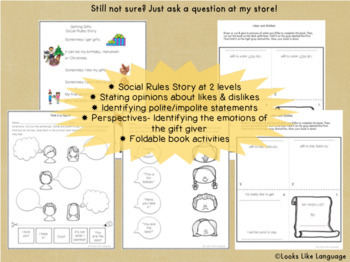 This social story is so useful for our kiddos and I appreciate you taking the time to share it with the rest of us.